We have the first of what we intend to have many of and that's our cabin. 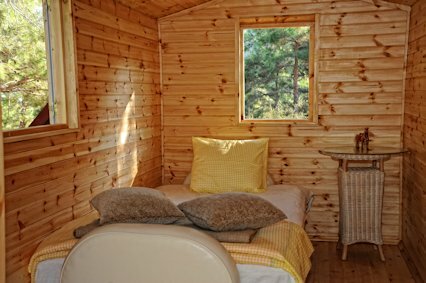 This sleeps two people comfortably and with our outdoors shower and the use of the Restaurant kitchen and toilet facilities makes an alternative, close to nature living space. Please ask, if you are interested. We also allow camping on the site. Please also ask.